The dial consists of a circular brass plate with a pivoted compass in the centre, so that it can be used with either side of the plate. On one side of the plate are the names of the winds in Latin, and on the other they are engraved in Italian. The instrument is very similar to Epact 37081, even though this example is more detailed. 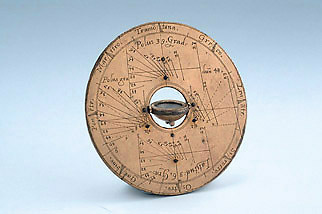 Both dials have been attributed to the same maker, Carlo Plato of Rome.